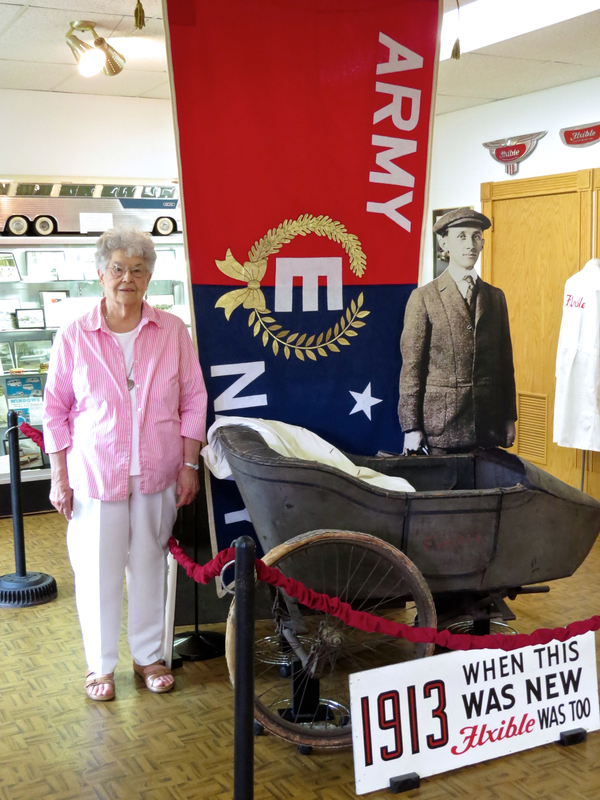 Norma Snyder with the flag replica she made from scratch – now on display at the Cleo Redd Fisher museum in Loudonville. I have to admit that my years with the Ashland Times-Gazette represented a coming of age. When I arrived there in 1997, I had no idea what to do. All I had going for me was raw writing talent and an instinct for tracking down stories. I also had one major handicap; I thought the world revolved around me. It took a few years, but I gradually realized that journalism isn’t about journalists. It’s about the people we cover. It’s a sacred trust. It’s about capturing the essence of the people and their times – not just to let them know their lives counted for something, but to preserve those nuances for future generations. I recently had the privilege of interviewing a member of what has been described as the greatest generation, the folks who carried us through the Great Depression and World War II. It was one of the most touching interviews I’ve ever done. I’ll let her story speak for itself. This article appeared in the June 30 Loudonville Times. LOUDONVILLE — During World War II, Norma Snyder helped make history at the Flxible plant. Seventy-one years later, she remade history — this time for the Cleo Redd Fisher Museum. At the age of 17, Snyder worked at the plant, making airplane parts for the war effort. She was on hand in August 1944 when Flxible was honored with the Army-Navy “E” Award flag for outstanding production of war materials. It was quite an honor for Flxible, which also produced gondolas for blimps and naval sonar components. During the war 85,660 companies produced war materials. Only five percent received “E” Awards. In 1945, Flxible received a renewal of the award for continued excellence. That allowed them to add a white star to the flag. Somewhere along the line, the flag got lost. Snyder, a former Mohican Historical Society board member and longtime museum volunteer, remade history by sewing a full-size replica of the flag. She brought it in to the museum earlier this month and it’s now on display in the lobby. Snyder is a quilter and has experience making large banners for her church, Zion Lutheran Church of Loudonville. So, museum curator Kenny Libben asked her in April to make a reproduction to replace the lost one. It wasn’t easy. All she had for reference were photos of the original. Her daughter, Connie Snyder McGowan, a retired art teacher living in Columbus, helped with the letters. The shape of the flag, a design known as a swallowtail, also made the job challenging. Working part-time, it took Snyder more than two months to gather the materials and make the eight-foot by four-foot flag. Snyder, whose maiden name was Stitzlein, was only 17 and still attending Loudonville High School when she started working at the plant. She worked during the summer before she graduated in 1944 and full-time afterward. A lifetime Loudonville area resident, she attended Greentown School, a one-room schoolhouse that still stands on the property of a relative at County Road 775 and Ohio 95. The building was moved there from another location near County Road 775, commonly known as Honeycreek Road. She went to work at Flxible because the company was doing war work. Most the workers on her crew were women. “There were some men, and a lot of young people like me,” she said. Snyder was no stranger to hard work. Flxible was the lifeblood of the community back then. The company provided employment for area residents, often from the time they graduated high school until they retired. For many, it was a family affair. “I had three sisters who worked in the office at that time and one of my brothers worked there for a short time before he went into the service,” Snyder said. She continued to work at Flxible for a year or so until war production tapered off. She and her husband, Robert Snyder who passed away 18 years ago, had five children. Four live in the Columbus-Delaware area and one in Lexington in Richland County. The family has grown to 14 grandchildren and 12 great-grandchildren. “So, we started something, didn’t we?” she said. Snyder was the youngest of nine children. Three of them are still living. Her husband had nine siblings. “There were six boys and four girls, and four of the boys in his family were in World War II and one was in the Korean War,” she said. In 1951, her husband built a building and rented it out for a couple of years. The Snyders built many houses in the area. She remains active with the historical society. “I’ve been a member for many many years, but I don’t do as many physical things as I used to,” Snyder said. She’s hoping more people will step up and help preserve the area’s history for future generations. Her effort to replace the lost Army-Navy “E” Award flag helped preserve a part of that history. When Snyder stopped by the museum last week, curator Libben thanked her for all her hard work. “It was a labor of love,” she responded. Perhaps the same could be said for her efforts during the war years — and throughout her life. But then, that’s how history is made. And preserved. The Cleo Redd Fisher Museum and Mohican Historical Society can be contacted at (419) 994-4050 or by email at info@crfmuseum.com. The website can be accessed at http://www.crfmuseum.com/ and the Facebook page at https://www.facebook.com/CleoReddFisherMuseum?fref=ts. 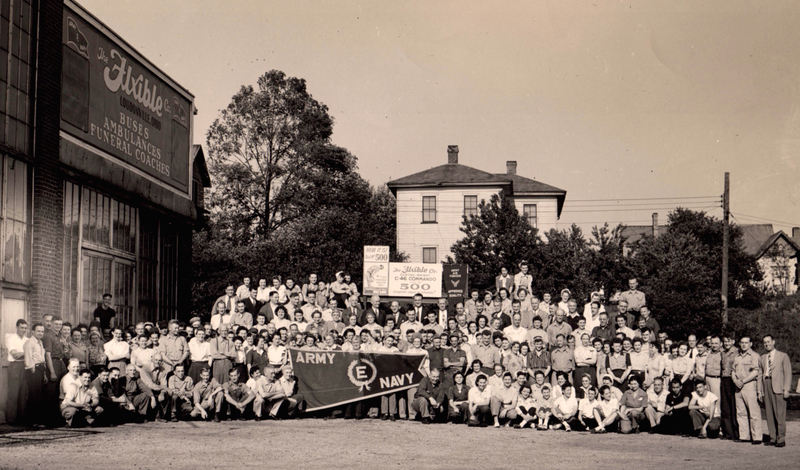 Flxible employees gathered for a photo with their “E” Award flag in August 1944. Norma Snyder is the fourth person to the right of the flag in the front row. For the past couple of years I’ve paddled past what appeared to be a geocache secreted along a high bank of the Mohican River. 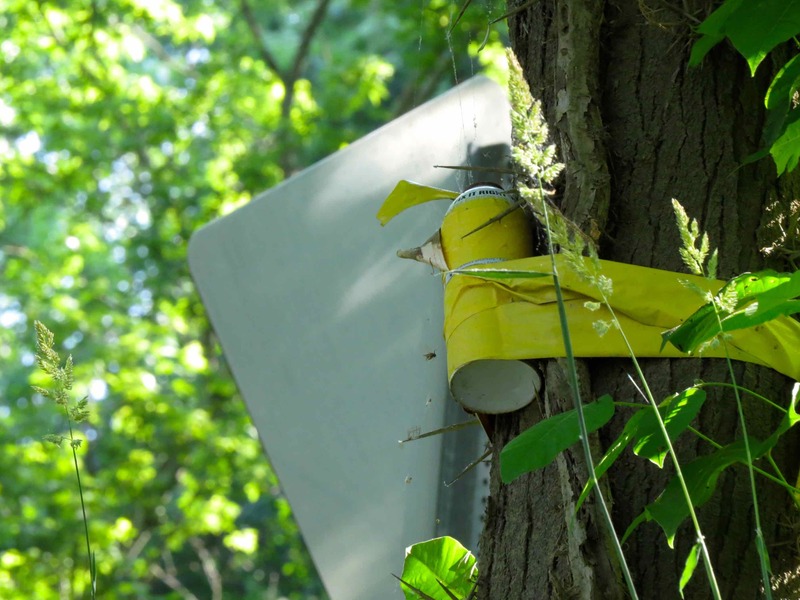 It looked to be a canister taped to a tree along Township Road 368 in Coshocton County. On a recent canoe trip, curiosity got the better of me and I stopped to investigate. Scaling the 15-20 foot bank was not unlike rock climbing — with poison ivy and stinging nettles thrown in to make it more interesting. When I got to the top, I found that the tree also was wrapped in poison ivy. And the geocache turned out to be an aerosol can. As near as I can figure, it had been attached to the tree by one of the rocket scientists at the campground across the river — presumably as a target to be exploded by gunfire. If that’s the case, he either was a poor marksman or came to his senses before firing rounds directly at a public roadway. Or maybe it was placed by a ghost from the Walhonding Canal. Brad Von Blon — hard at work. 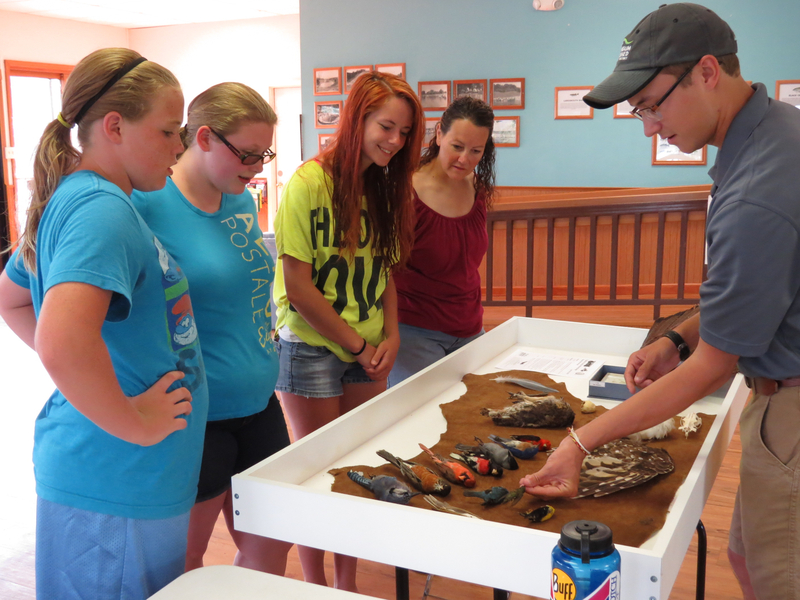 In order to accommodate the family of Brad Von Blon, a young man who is working as a naturalist this summer at Pleasant Hill Lake Park, I’m posting a feature article about him here so family members can access it. Not being subscribers to the Loudonville Times-Gazette, family members couldn’t access the story. I enjoyed meeting Brad and was encouraged to find a talented and dedicated young man dedicated to bringing nature to park visitors and vice versa. I first laid eyes on her 35 years ago, the first time I canoed the Mohican River. Through the shadows of a late afternoon – and the fog of too many beers – I saw her standing in the window of an A-frame house high above the riverbank. I didn’t realize it was Dolly Parton then. Just some lady admiring the riverscape, deep in thought perhaps. So much so that she didn’t notice me. Otherwise, she surely would have waved back when I waved to her. Over the years, I grew older and wiser – and soberer — and realized she wasn’t real. Just a cardboard standup of Dolly Parton placed in the window to amuse canoeists. Still, I longed to meet her. I’d come to know the owners of the house, the Conrads. Every time I paddled by I hoped to catch them at home so I could visit Dolly. Finally, it happened. On Wednesday I was paddling by – en route from Charles Mill Dam to Mohawk Dam – and noticed smoke at the rear of the house. Which meant someone was home or the house was on fire. Either way, I had to investigate. I shouted up to the house. Gretchen Conrad hollered back. I beached my canoe on a small gravel bar and climbed up the steep bank through poison ivy and multiflora rose. Anything for a chance to meet Dolly. 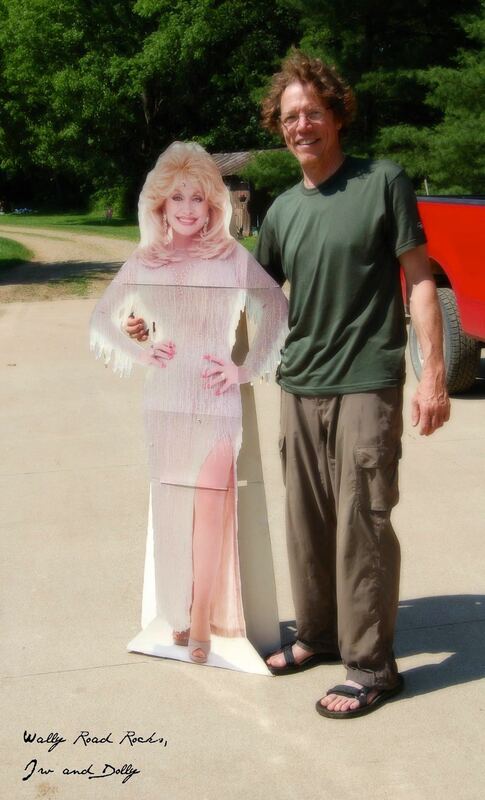 After visiting with Dolly and posing for a photo, I pried myself away and continued downstream. To camp … and dream of sweet Dolly. 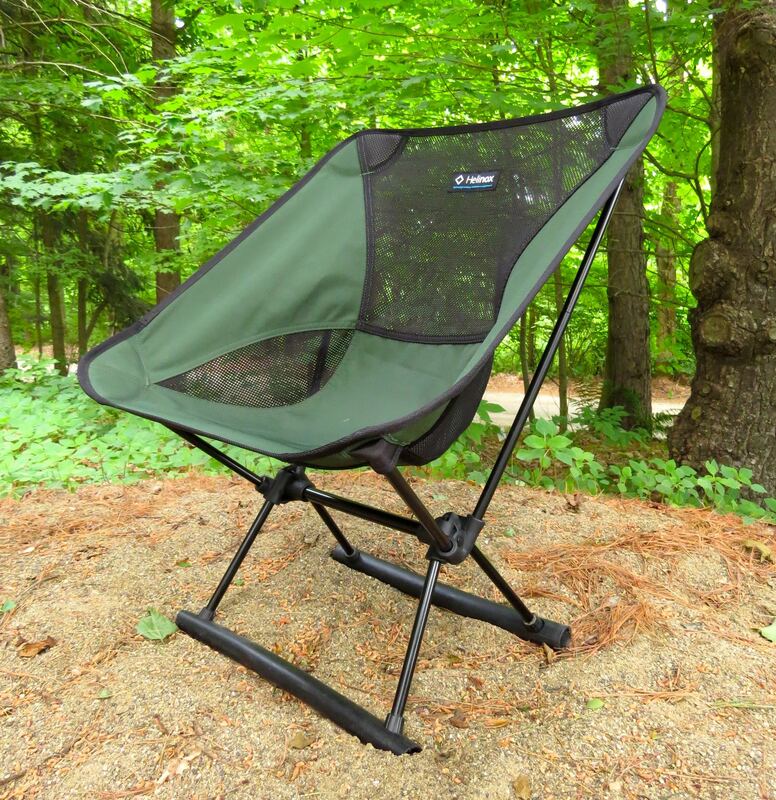 That sinking feeling you get when you sit on a backpacking chair on soft ground. As mentioned in a previous post, I love my Big Agnes Helinox backpacking chair. At two pounds, it proved to be a great alternative to the 8-pound beast I had been lugging around. But, once I used the Helinox in the real world — on soft ground — the honeymoon was over. Temporarily. As indicated in numerous reviews, the legs of these chairs, and similar designs, are narrow and tend to sink into the ground when you sit on them. Unless you happen to be camping in a parking lot or your living room. I found a solution to the problem using leftover materials from my “poor man’s Yakima bar” (another post for another time). 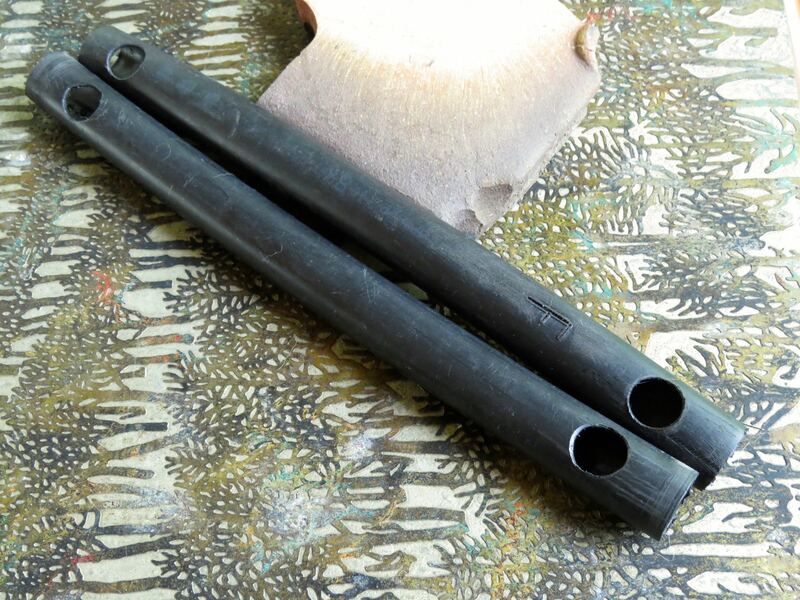 Well tubing sections. Note that one is marked with an “F” to indicate that it goes on the front. After I bridged the legs with plastic 1.25 inch diameter well tubing, I no longer got that sinking feeling every time I tried to sit down at my campsite. Weight’s obviously a concern, but it’s a lightweight material. Both leg attachments combined weigh 5.3 ounces (about 152 grams for my friends on the other side of the pond). With the Helinox legs, I noticed the front ones were spaced slightly wider apart than the rear. I compensated for that in drilling my holes. To avoid confusion come set-up time, I used a gasket scraper and screwdriver to burn an “F” into the front one. I used a hole cutting drill bit to make the holes. In my first attempt, I used a 7/8 inch bit. This prototype worked well. It kept the legs from disappearing into the sand. However, the holes were too big and the brace fell off when I picked up the chair. 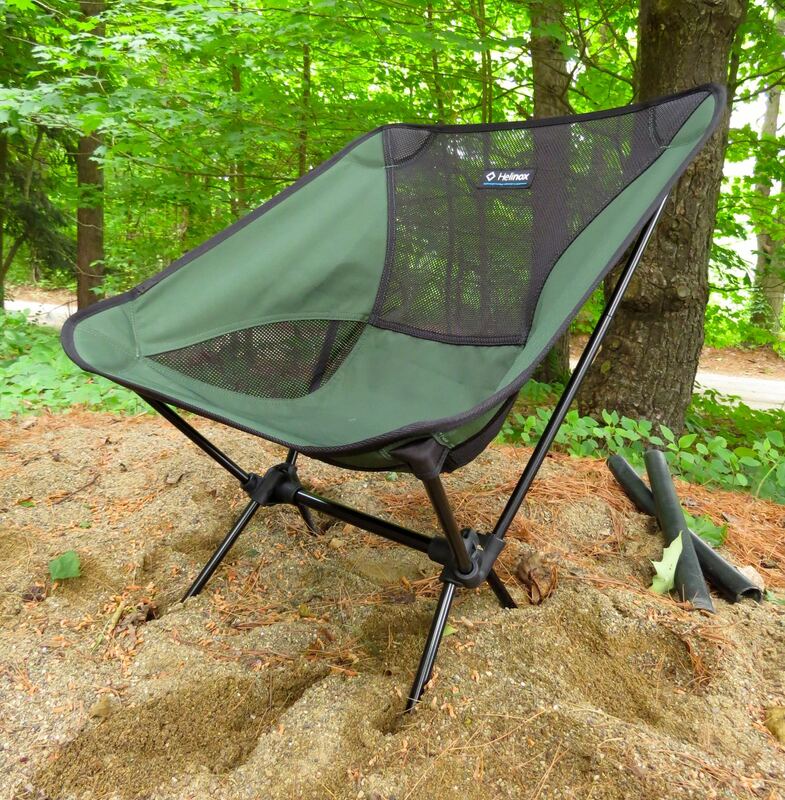 Not a big deal, but you kind of want them to stay with the chair when you have to pick it up to move out of the smoke from your campfire. Or if you have to move it for some other purpose, such as fending off a charging bear. Or a fellow camper who wants to steal your chair. For the finished product, I bored a 3/4 inch hole and reamed it out with a domed grinding bit. This put a slight bevel on the hole to allow the braces to pop onto the leg ends. They fit snugly and stay with the chair when you move it. Problem solved. I put my leg braces the ultimate test — sitting on the chair atop a sand pile. This is all the farther it sank with my full weight on it. They are too long to fit into the bag that comes with the chair. I got around that by packing them with my tent poles. It also helps to wipe down the braces with Armor All, pure silicone spray or a similar product. What do you think? Should I start mass-production? Where is Norman Rockwell when you need him? Life has come full circle in Loudonville, Ohio, and I’m grateful for having witnessed it. 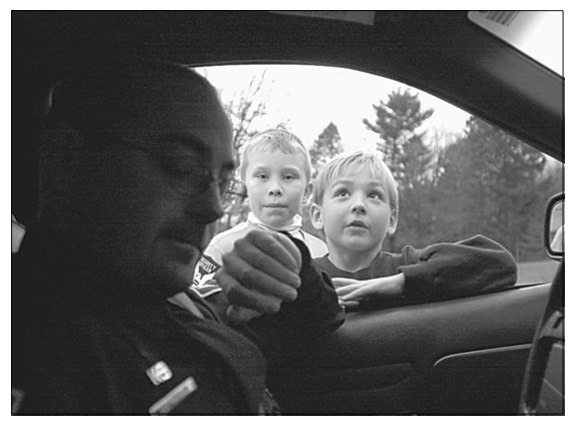 Fourteen years ago, while working for the Ashland Times-Gazette, I wrote an article about Loudonville Police Sgt. Kevin Taylor, a man who clearly loved his job and his hometown. Over the years, I had the pleasure of watching Taylor advance through the ranks. He’s now police chief. Fast-forward to May 18. While covering a village council meeting, I witnessed the swearing-in of a young police officer, a 23-year-old named Sean Gorrell. The Loudonville Times asked me to find a subject for a profile piece. Since Gorrell was a local boy, born and raised there, I thought he fit the bill. While working on the piece, Taylor told me Gorrell had been one of two boys mentioned — and pictured — in the story I’d written about him 14 years earlier. Gorrell was 9 years old at the time. And an aspiring police officer. Sometimes stories write — and rewrite — themselves. * A few people have asked about the other boy in the photo. He’s Christopher Rooks. He was 7 years old when the photo was taken. The photographer was Amy J. Van Horn.